As is common in the vastness of Christian tradition, we lean in such times on the recollection of God’s provision in our past. We are a resurrection people, Rev. Brian Adkins reminded us yesterday - an Easter people. The movement for LGBTQ justice and inclusion in The United Methodist Church has been built by a hope and a common spirit that we inherit today. Hope is our inheritance, and justice is our command. Today, the Church continues its work to amend and advance legislation out of committee. All delegates belong to a single legislative committee to which all legislation deemed in harmony is assigned. This singular legislative committee will consider plans and petitions for perfecting in order of High Priority ranking. During this time, bishops, delegates, and staff will gather on the floor. Observers will be located in the seating and outer concourse areas of The Dome at the America’s Center. You can live-stream the event at www.umc.org/live. The second day of General Conference and the first day of the legislative session of General Conference 2019 began with morning worship and a sermon by Bishop Ken Carter. Today is the first of two days of the General Conference in which all delegates operate primarily as a legislative committee after the prioritizing vote on plans and petitions. 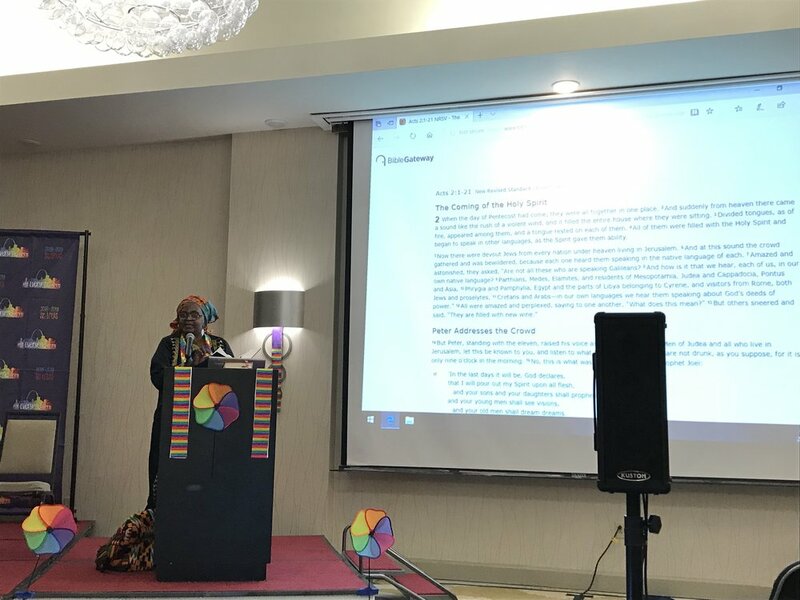 After worship and before the report of the Commission on the Way Forward, there was a processional and singing by LGBTQ+ persons of color and allies. Next, members of the Commission on the Way Forward passionately presented on the process and results of their work together. 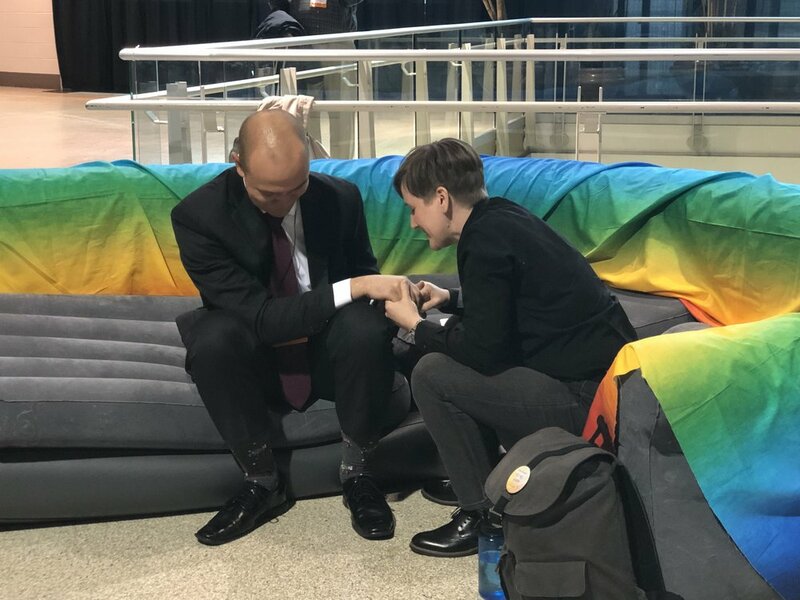 A significant moment was when commission member Alice Williams identified herself as gay while sharing about the relationships between, and the make-up of, the commission members. She and other members shared about the relationship-building that occurred before any work began on creating a way forward and the strong bonds that were formed. Next, three different members presented the three proposals put forward by the commission: The Connectional Plan, The One Church Plan, and The Traditionalist Plan. There was an addendum that the Council of Bishops directed to be a part of the Traditionalist Plan presentation, stating that the Traditionalist Plan was not part of the entire process of discernment and planning like the other two plans. It was added in at the last meeting of the commission at the request of the Council of Bishops. When we came back after a break, persons who are LGBTQ+ and their allies began another action within the upper level of the arena. It began with the chant, “Hate divides, love provides; hate divides, love survives,” and continued for several minutes within the arena, outside in the hallways, and then in a processional around the upper level of the arena. The action continued while the general conference was adjourned and prepared for the meeting as a legislative committee of the whole, and it continued through most of the nomination process. There was not a training of officers for legislative committees for this general conference, so only those who were trained at the last general conference were eligible to be elected to lead the legislative committee. The officers elected were Chair: Joe Harris; Vice Chair: Betty Kazadi Masau; and Secretary: Carlene Fogle-Miller. After a break, we came back to preside over the legislative committee. All 23 of the petitions must be dealt with in the legislative committee and the recommendations are made to the general conference to act on them. Today we dealt with one: the two petitions from Wespath dealing with pensions. It was approved to advance out of committee with a vote of over 94%. At that point, the chair decided that the 55 minutes left in the session were not enough to deal with the Traditionalist Plan. After a couple of questions about the openness of committee meetings, a motion was made to adjourn for the evening, and we adjourned at 5:45pm. Rev. Grace Imathiu led an interactive Bible study on the story of Pentecost (Acts 2). With clarity and delight, she drew parallels for study participants between the multi-ethnic, multi-lingual gathering at Jerusalem portrayed in the Scripture and the gathering in which we find ourselves in St. Louis. A staunch advocate for LGBTQ inclusion, Rev. Imathiu named the frustrations and pain in the room and encouraged participants to continued hope and resistance against bigotry. “This could be the United Methodist Pentecost,” said Rev. Imathiu. She gave the microphone to respondents who were moved by the Scripture to see similarities between our current struggle and the early Church’s own struggles for equity and harmony. One respondent noted the sheer number of ethnic backgrounds enumerated in the passage. One respondent highlighted a portion of verse 17: “Your children will prophesy, your young will see visions,” affirming his sense that younger United Methodists are shedding homophobia and transphobia. Another respondent highlighted the following portion of the same verse: “Your old will dream dreams,” citing that the elders of her local congregation have taught her to be a more justice-seeking United Methodist - and that perhaps there is still time for the Spirit to instill dreams in General Conference delegates. Rev. Imathiu’s Bible study will meet again tomorrow from 8:00p.m. - 9:00p.m. in Washington/Broadway (Holiday Inn). Rev. David Meredith facilitated small groups where General Conference attendants could debrief the day’s proceedings and activities. 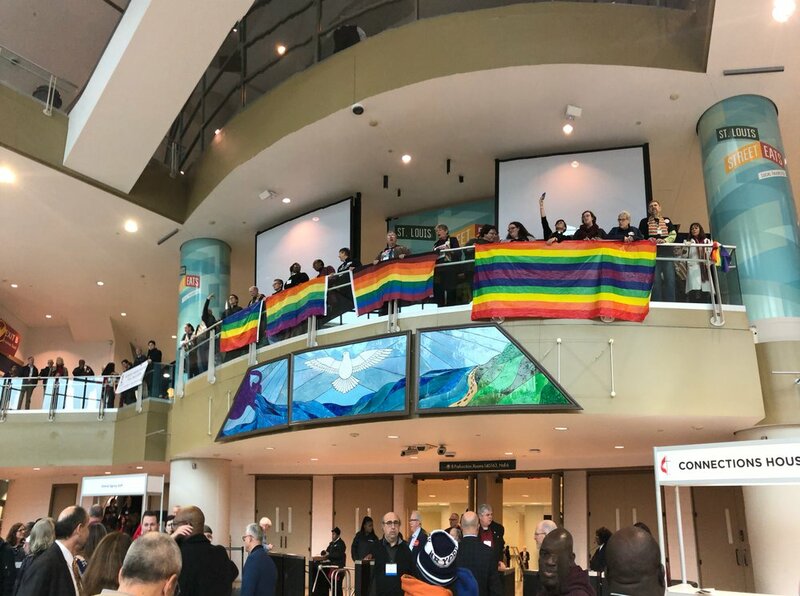 The fast pace of the General Conference, the constant threat for LGBTQ people of being talked “about, not with,” and the pain of exclusion and injustice have left many attendants with a deep need for a space like Koinonia Groups. Group members were invited to wholly listen and to wholly share as they felt led and comfortable. Respondents shared phrases, words, and images from the day that captivated them; they voiced questions and concerns, and they delighted together in “God moments” experienced and witnessed during a day of high hope and anxiety. Koinonia Groups will meet again tomorrow from 8:30p.m. - 9:30p.m. in LeClede (Holiday Inn). Henry Chiu is a member of Bering Memorial UMC in Houston, Texas. He feels at home at Bering Memorial because of their commitment to addressing social justice concerns. Bering Memorial is the first Reconciling Church in the Texas Annual Conference. The church continues its historic commitment to health and wellness ministries, including a dental clinic that initially served people diagnosed with HIV/AIDS, and operates a homeless youth ministry. Being present at General Conference and serving the Love Your Neighbor Coalition means a lot to Henry. 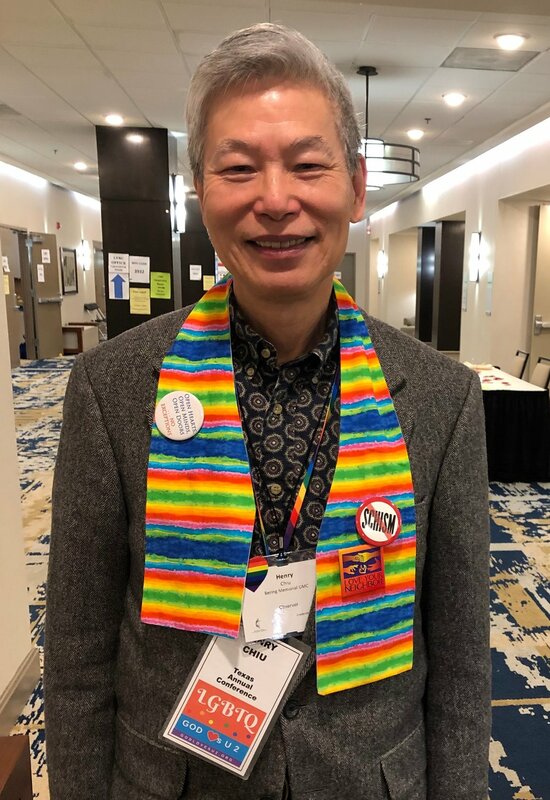 He wanted "to be a witness to this historical event of the church, wear a rainbow stole, and show support for LGBTQ community that God loves all and all deserve a place at the table in our United Methodist Church." He hopes we at least can take a step forward so that all people can be included in The United Methodist Church. Mary is a member of the crew distributing prayer cards to General Conference participants as they leave the convention center for the day. Mary says social justice is an inherited component of the family's faith: "My grandfather moved from town to town because he spoke out against the Ku Klux Klan." She works for full inclusion locally through a PFLAG group in Jacksonville, TX and the Reconciling group in the Texas Conference. Did you bring items to donate to local St. Louis ministries benefitting individuals and families experiencing homelessness? Please bring your items to the Love Your Neighbor Coalition offices in the Holiday Inn (811 N 9th St.) across the street from the Convention Center. Thank you to all of you who’ve brought and are bringing items or funds for donation! All of God’s beloveds are deserving of dignity, comfort, and hope. LYNC is glad to partner with the Emergency Winter Warming Shelter at AmeriCorps St. Louis for this project. The Warming Shelter is one of eleven emergency shelters that partner with the Winter Outreach Group to ensure that St. Louis’ most vulnerable individuals have a warm place to sleep and food to eat during nights when the temperature drops below 20 degrees. This is an LGBTQ-affirming organization and one of the only shelters in the area that lets couples and families (including pets) stay together.